Thanks to The Rolling Spring Roll in Farmingdale, Long Island finally has its own Vietnamese restaurant! Yes, you read that right, this is the only Vietnamese restaurant on this entire, very Long Island. As the name suggests, The Rolling Spring Roll started out as a food truck and last summer opened as a small storefront restaurant on Farmingdale's Main Street. The interior is clean, basic and sparse, and the prices are very reasonable. The service during a busy Saturday lunch was fine. The focus here is definitely not the atmosphere, it's the authentic Vietnamese food. 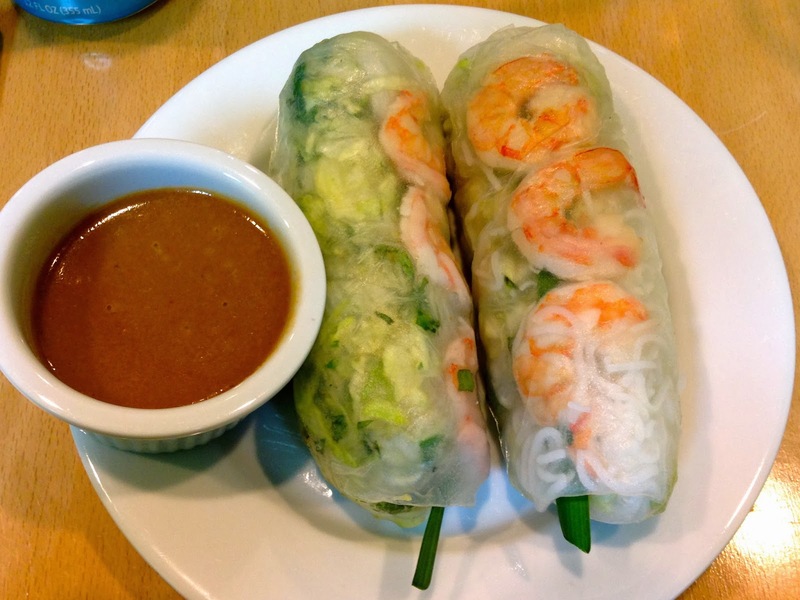 We started with an order of Vietnamese Spring Rolls and Summer Rolls, my personal favorite. The Vietnamese Spring Rolls were very crunchy, and the filling was delicious - ground pork, carrots, onions, spices, with a light vinaigrette dipping sauce. 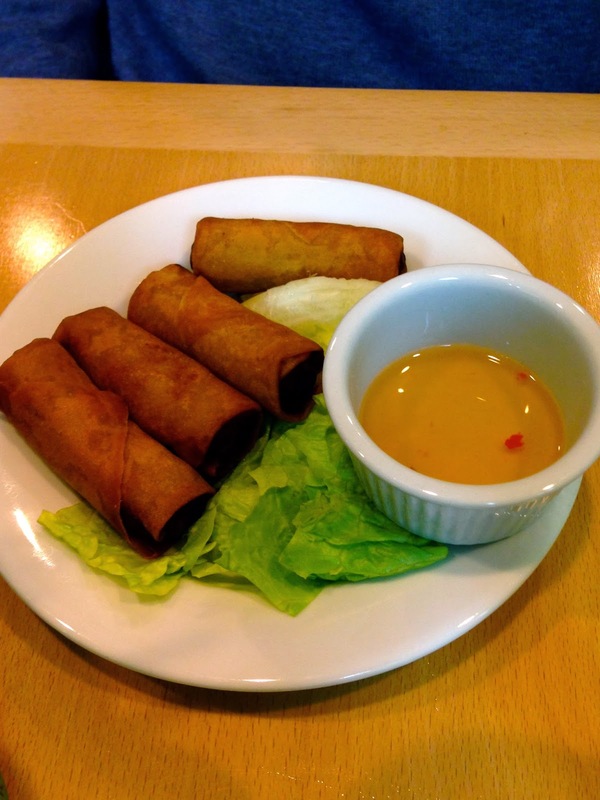 They are served with iceberg lettuce to wrap around the spring roll before you take a bite - this gives a very nice, refreshing crunch to the spring roll. The Summer Rolls were excellent. Rice paper is wrapped around a heaping mound of rice noodles, shrimp, roast pork, lettuce, cilantro, scallions, mint, and Thai basil. They are served with a sweet and slightly spicy peanut sauce for dipping. Super refreshing and light with an explosion of flavor from all the fresh herbs and scallions and the peanut sauce, I highly recommend ordering these. My only complaint would be that the pork was a little dry. I would prefer to have just the shrimp in my summer rolls. On to the reason we went to The Rolling Spring Roll: the pho! What is pho, you ask? Pronounced "Fuh," pho is a traditional Vietnamese soup that consists of a flavorful beef broth flavored with spices, herbs and scallions and filled with thin rice noodles and topped with meat. It is served with a side of fresh toppings such as bean sprouts, Thai basil, fresh lime, etc. that you add to the soup as you eat it. We ordered the Pho Bo - beef pho, and it did not disappoint. A huge bowl of rich beefy broth spiced with hints of Chinese Five Spice, scallions, and onions is filled with cooked rice noodles and topped with thinly-sliced rare beef, beef brisket and beef meatballs. On the side, you get your choice of bean sprouts, Thai basil leaves, sliced jalapenos and lime wedges for topping the soup. I added a little bit of everything to my soup and mixed it all in to blend the flavors. The soup was excellent before I did this, but the spice from the jalapenos with the bright zing of the lime was the perfect addition. The beef meatballs were my favorite - very simple, but rich and meaty. The beef brisket and thinly-sliced beef was very tender and delicious. This is the type of meal that just makes you feel better after you eat it, and I can imagine it being a really good hangover cure. 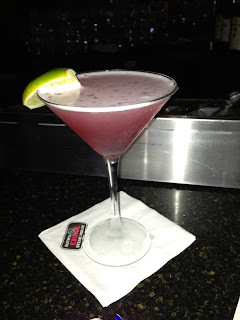 Definitely something to try after a really fun night, or any other time!